1. 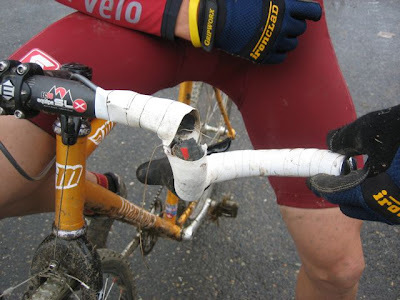 Easton EC90 Equipe SLX Failure : Props to velonut for this interesting image. Our protagonist was attempting some innocent cyclocross gleefully on his single speed, and then boom came the anti climax. His Easton EC90 SLX handlebar (touted as the "stiffest, lightest carbon handlebar possibly available") made of Easton's carbon nanotube technology apparently just couldn't take the heavy duty riding imposed on it and breathed its last with a snap. This is the same bar that Bike Radar calls "as tough as it gets", and supplements with the often heard "they're more likely to resist failure than other carbon bars in the event of an accident". Sure, but we here at Cozy Beehive take everything with two grains of salt. Notice that the fork has an "anatomic" design, and that it broke not at the stem interface (a common site for failures) but closer to where that first bend occurs. I can see a cx rider pulling up on the handlebars alternatively with a good amount of force as he shoots uphill, not only to give him an extra momentum but also to maintain that front wheel in a straight line on mud and grass (atleast this is what I would do). Add to this the beating the bar takes when mounting and dismounting the bike to get over obstacles and impacts due to crash. I couldn't tell you in which direction the carbon fiber plies were laid in that section, but could it be that they were placed in a way not anticipating the directions of actual riding forces? Remember the Ax Lightness Daedalus seatpost failure we saw last month? Yeah, same deal here. 2. MIT Professor Investigates Fork Failure : This month's issue of the Design News magazine had an interesting one page article on failed fork forensics. Ken Russel, Professor Emeritus of Metallurgy and Nuclear engineering at MIT, was consulted on an investigation into the detachment of a front fork on child's bike (jeez!). The kid took a nasty header and crashed his face onto the pavement. Mr. Russell found that the mild steel fork and steerer tube were arc welded in a bizarrely incomplete fashion. Instead of anticipating a good weld all around the tube, just two flimsy tack welds were actually observed! This just goes onto to show why you must look into buying a quality product for someone, especially if that someone is your own kid. The take home message from encountering bicycle failures is this - Don't keep your mouth shut. Speak up and complain about it. You deserve your compensation and respect. Chances are, it will never happen again, even to someone else. Sometimes, I'm terribly ashamed of the bicycle industry. Everyone talks about how we should get our roads safer for cycling. You know what, first get the bikes we ride safer to use! I was at a cross race two weeks ago and saw someone break a Specialized Carbon/Zertz seatpost. Pretty scary for me since I had just swapped out the same type of post for a Thomson. Why does it seem to me as if the fragile fork case has Walmart written all over it? Your assessment of this is a bit misguided. The location of failure for the majority of carbon road bars is at that exact location. Lay your road bike on the ground and look at the point of contact the road bar hits. Mode of failure is typically due to a previous impact of the drops during a crash and for the energy to become focused at that point. A micro crack develops, which is not noticed at that moment but as the crack propagates the area then becomes compromised. Now, what would also be interesting is to know if the bar was mfg in a single layup, or if they were mfg like all Easton carbon bars of the past which were actually 3 pieces bonded together. I wonder if this model passed the EN testing? 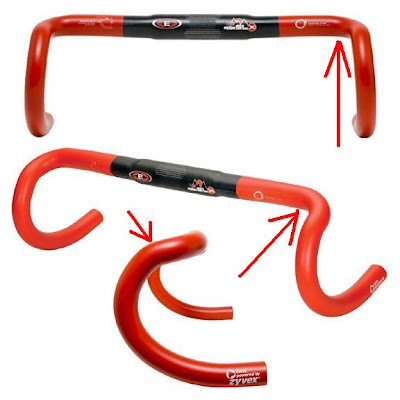 Regardless, there is no standard for handlebars that requires the product to survive a specific amount of impact. Not EN, DIN, DIN+, CPSC, JIS . . .
With carbon fiber, impact resistance is really the metric to focus on, and not so much fatigue because if the design and layup are decent the bar can typically car outlast any fatigue test requirement, but will typically fail after the first sizable impact it receives. Anon : From the many incidents I have seen, carbon fiber composite handlebars have been failing mostly at the stem interface, where the concentration of clamping forces are pretty high. Most of the stems in these cases were the 2 bolt ones. Bars, particularly at that section has to be designed well, with good cross section and smooth bends. I meant , no indication of the history of the bar is known either. Karl : I'll keep a look out for damaged Zertz. Thanks. Anon @ 8:50AM : Ken Russell tells me the bike in this case was a Murray BMX bike. I don't think it's a problem with carbon fibre itself but rather with using wrong tool for the job, while being obsessed with low weight. There are plenty of carbon components used in MTBs e.g. Easton Monkey DH at 225g and failures out of blue are extremaly rare. It's cyclocross, a sport posing many risks to bike and self. Stuff breaks, especially if you are chasing the lightweight dream pedaling WFO. On most occasions metal bends, plastic breaks and crashing is a given. Buy your cross rig and parts keeping this in mind. Note the clump of ground on the pedal/crank arm in the picture, I bet the wheels really came off the bus in this wreck.